Prior to a Saturday afternoon outing with Sarah Hotchkiss & Carey Lin, co-founders of San Francisco-based Stairwell’s, I set out to my normal, meandering research of Sanborn Fire Insurance Maps in search of lost, public infrastructure. During a meet-up with them at Collective Espresso OTR last weekend, I told them about the nuances of stairways and alleys in Cincinnati from my experiences. The abandonment of some stairways, but not others, can be perplexing for locals and visitors alike. Investment and disinvestment show no discernible patterns and almost always present impediments where connections are needed most. Hotchkiss & Lin in town to do what they do best: planning organized public stairway “Field Trips” (interactive walking tours of stairways) while they’re in Cincinnati, a residency leading up to a three-week exhibition at Camp Washington’s Wave Pool Gallery. Back home they lead Field Trips, public art installations and the assembly of publications to correspond to each installation. This Saturday, I thought I’d invite them to coffee in a neighborhood that is known well for its stairways and hills but not so much for its walkability. Since their arrival last week, they’ve hit the popular coffee spots, stairways, neighborhood haunts in Downtown, Over-the-Rhine, Mount Adams, and Clifton Heights. East Price Hill and the community hub BLOC Coffee Shop seemed like a logical destination, considering their proximity to the nearby Price Hill Incline ghost (the Incline Public House notwithstanding). We chatted about the odd vacancy across the street, debating whether it was lavender or gray, whether it housed a chicken carryout or holds a future as a yoga studio. I pointed out the vacant land to the east, which was occupied by numerous mixed-use buildings that met the wrecking ball just years earlier. Much like previous, impromptu, exploratory outings of mine, I tend to soak up as much cartographic data as possible and visualize a landscape through the lens of missed opportunities and great possibilities. Price Hill is full of those missed opportunities, plagued by bad investment deals, shifting demographics, and local politics that seem to forget westside neighborhoods perennially. The neighborhood blocks and the promise for better walkability are there, however. The street layout in East Price Hills follows a grid pattern better than most Cincinnati neighborhoods, molded by a mere buckle in the rug. However, that which makes East Price Hill stronger also weakens its connectivity to other communities defined by harsh terrain. And we’re not helping. East and Lower Price Hill’s stairways are a scattered array with very few direct connections, many of them connecting streets that have lost their density or usefulness. In a brief visual survey of pedestrian connections between East Price Hill and Lower Price Hill, only a partnership of public stairways at Wilder Avenue, Maryland Avenue, and the little known Peerless Street provide the opportunity to forge walkability of the eastern Price Hills together. All other stairway spans between the neighborhoods fall short of providing a linkage for both neighborhoods. The Staebler Street Steps lead from State Avenue in LPH to lower Maryland Avenue, but not much closer to the branded Incline District that makes up the eastern core of the EPH. Sidewalk stairways along Elberon and Maryland Avenues help in the traversal of steep hillsides near the banks of the Ohio River. But today’s EPH and LPH don’t exactly demand greater provisions for walkability along Maryland Avenue, a street severed into two by an April 1987 landslide. A pedestrian connection between East Price Hill and Lower Price Hill is a critical provision to encourage walkability between two neighborhoods in transition. Each of the stairways in question have immediate access to public bus transit stops. While the Peerless Street Steps (Step ID #317: 2413 Glenway to 2485 Warsaw) were recently redone with a newly reconstructed retaining wall along Glenway Avenue, its summit at Warsaw Avenue is already overgrown and difficult to spot. The Maryland Avenue Steps (Step ID #303: 2465 Warsaw to 2607 Maryland), between Warsaw and Maryland, are also closed and appear to be have been sold to an adjacent properly owner. An unnamed paper alley between Maryland and Mount Hope Road remains a public right-of-way (in part) that could facilitate the connection into the Incline District. However, a Planned Development District at 2614 Price Avenue (at Mount Hope Road) compromised the western end of the alley. As Sarah and Lin peered over the Incline District overlook at Olden View Park, they surely imagined the direct transit connection that saw its last ride in 1938. Since then, there has been no direct connection without help from the automobile between Lower Price Hill and East Price Hill. The aforementioned stairway closures have not made non-automotive connections any easier. 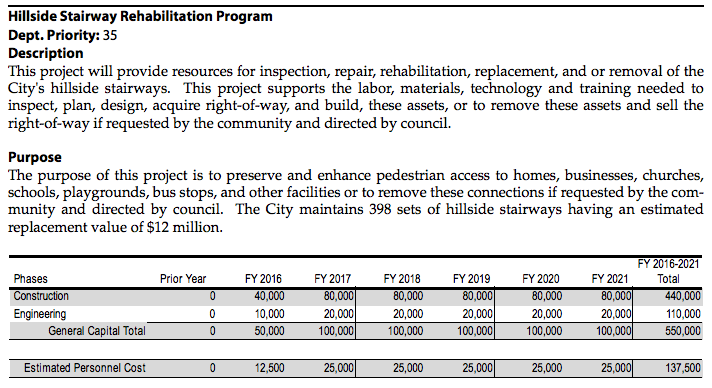 Since 2012, Cincinnati City Council has not approved renewal of funding for the Hillside Stairway Rehabilitation Program. A fund that once housed up to $250,000 in improvements has been reduced to zero. Fortunately, a proposed biennial budget for 2016-17 includes a recommendation for a $50,000 allocation in FY 2016 and $100,000 in FY 2017. New monies could be used to forge new pedestrian connections and to reopen shuttered ones. Despite all the brainstorming to assemble a logical connection between two isolated neighborhoods, issues with walkable opportunities will remain for now. Herein lies the problems with a lack of priority given to pedestrian access, elimination of public rights-of-way, and abandonment or removal of public infrastructure. But dangerous crossings along the busy streets of East Price Hill’s eastern edge may prove to be irreconcilable. Return of the Price Hill Incline may have a better chance than a pedestrian gateway, one which would improve connections to transit (Metro Route 32 & 33, without a transfer!) and provide choice to passengers, improve access to businesses and places of worship, and broaden opportunity for parents to send their children to either Oyler School or Holy Family. A patented Field Trip from Stairwell’s may be far fetched in Price Hill. As Sarah Hotchkiss suggested, “they should just build a gondola lift.” Anything will be an uphill battle. Although a mechanized connection between Upper and Lower Price Hills would be nice, perhaps a stairwell along the the Incline ROW would be a more realistic goal in the interim. This seems like the most direct route. This entry was posted on July 26, 2015 by C. Huelsman in Alleys.